Business Process Outsourcing (BPO) is the practice of using a third party, contracted to perform specific, specialized process on a company’s behalf. 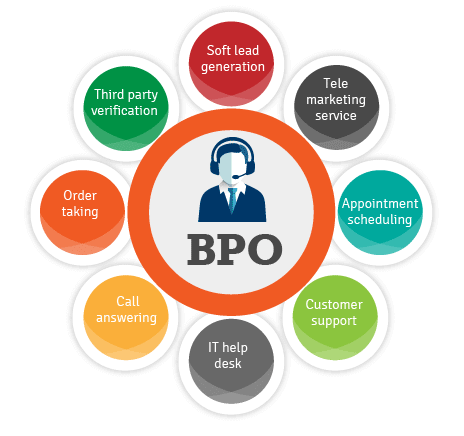 BPO is typically categorized into back office outsourcing and front office outsourcing. Back office outsourcing, which includes internal business such as human resources or finance and accounting. Front office outsourcing, which include call center services.BPO is about optimizing business performance to attain value creation. BPO provides quantifiable benefits through flexibility, improved efficiencies, focus on core business, lower overhead, reduced payroll and benefit expenses, and fewer capital investments. 24/7 across three shifts with capacity up to 170 agents per shift. Part-time, full-time, seasonal or year-round staff members, all suited to the needs of our clients. Off site disaster recovery location. Supscribe to our mailing list for offers, news updates and more! © 2017 WorldBridge Outsourcing. All right reserved.